Tuesday June 10th 1884 I was busy about the work all the forenoon and in the afternoon Rob and I went to town in the phaeton, Ott went with Hatt and I to select a chair to take to Grand-ma tomorrow. Rob does not feel as well today A letter from both Will Reed and Vene. 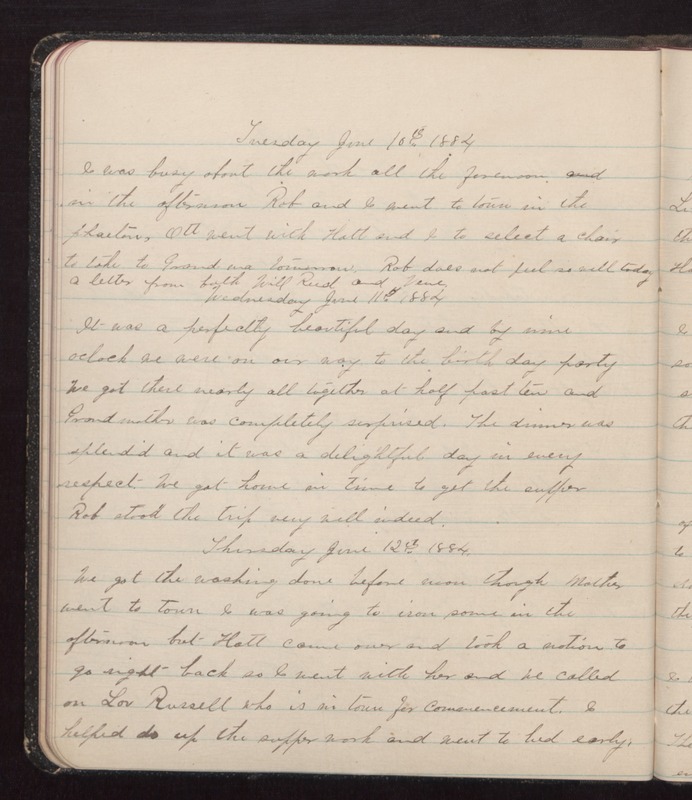 Wednesday June 11th 1884 It was a perfectly beautiful day and by nine oclock we were on our way to the birth day party We got there nearly all together at half past ten and Grand mother was completely surprised. The dinner was splendid and it was a delightful day in every respect. We got home in time to get the supper Rob stood the trip vey well indeed. Thursday June 12th 1884. We got the washing done before noon though Mother went to town I was going to iron some in the afternoon but Hatt came over and took a notion to go right back as I went with her and we called on Lou Russell who is in town for commencement. I helped do up the supper work and went to bed early.